Did you wake up today in your dream apartment? Now that you’ve moved into your fabulous new place, it’s time to show it off. When you have a house with great curb appeal, it’s easy to make your friends and neighbors jealous. But how exactly do you go about making your apartment the envy of the neighborhood? There’s only one good way to secure your status as the cool new neighbor. You have to invite your friends and neighbors over to see your new place! 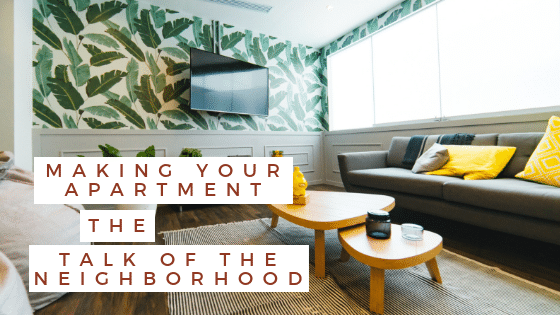 Check out these 5 tips on how to make your apartment the talk of the neighborhood (in a good way). Everyone loves a pop of color, but the truth is, some people are afraid to go there. If you live in an apartment building, there’s a good chance that every apartment looks the same. So if you want your place to stand out, you have to make it your own. Shake things up a bit and paint an accent wall. Some landlords will let you to do this – others will not, so you have to know what your lease allows you to do. If you’re allowed to paint, go for a bold color that really adds personality to your space. You want that wall to be the thing that makes people say “wow” when they walk through your door. Are you in an apartment where painting is strictly prohibited? That’s no excuse for living with those bland eggshell walls. There are lots of removable peel-and-stick wallpaper options on the market right now. Find a cool pattern that expresses your personal style and define an accent wall in your chosen print. When it comes time to move out, you can peel it off and not have to worry about losing your security deposit. In an apartment, you won’t be able to re-tile the bathroom or install new kitchen fixtures or countertops – so you’ve got to express your style in other ways. And the easiest way to do so is with furniture. You can’t knock down walls and make renovations to a place that you don’t own – but you can create a unique space with your furniture choices. It doesn’t matter if your style is mid-century modern, contemporary, or transitional. Whatever you’re into, look for furniture that captures your personal aesthetic. Then look for decor and accents that complement that style. This is what will separate your apartment from similar units in your building. To create a truly unique living space, it’s important not to fall into the traps that so many people fall into every day. For example, there’s no rule that says your TV has to be the focal point of your living room (though you will find that to be the case in most homes). Instead, place a chaise lounge in the middle of the room to serve as a focal point. If you want to encourage conversation, place two sofas facing one another. Instead of a bulky sectional or the standard sofa and loveseat combo, opt for one sofa and a few accent chairs. If lounging and snuggling is your thing, replace the traditional couch with two side-by-side chaise lounges. There are a lot of unique ways you can arrange your furniture to give your living room a fresh, modern look. The easiest way to become the talk of the town is to make yourself known as the person who throws the best parties. Once you get settled into your new place, throw a party to get to know your new neighbors and show off your fancy new digs. Don’t make the mistake of throwing a loud, rowdy, wild party. Be respectful of the neighbors who don’t attend and keep your noise level down. Otherwise, you might earn a reputation as the troublemaker in the building. As the seasons change, maintain your party host image by inviting friends and neighbors over for seasonal gatherings. Throw parties for Christmas, Halloween, Valentine’s Day, and the Fourth of July, and you can make your place known as the place to be. If possible, try to rearrange a few pieces of furniture every time you have a party. Get creative with fun apartment decorations and stylish holiday decor. This will keep things interesting and keep your friends and neighbors always wanting to come back for more good times at your amazing place. When you live in an apartment, especially a small one, it’s important to utilize as much outdoor space as possible. This includes everything from your balcony (if you have one) to your front door. Decorate areas that are visible from outside as best as you can. Hang fun, festive decorations on your front door in your hallway. Fill your balcony with trendy potted plants, flower pots, or string lights. Demonstrate your unique style by the way you decorate the outside of your place. If you do so successfully, your neighbors are sure to be curious about what you’ve got going on inside. Finding a great new apartment can be difficult – so once you do, you should make the most of it. With these tips and tricks in mind, you’re can make your apartment the talk of the neighborhood and establish your place as a stylish space. Arrange your furniture in interesting ways. Paint an accent wall or carve out a unique space with chic wallpaper. Host a party when you first move in and then continue to host parties as the seasons come and go. Decorate your door or balcony to give neighbors an idea of what kind of style you might be showcasing on the inside. If you keep things fresh and have a knack for changing things up, your friends and neighbors will want to keep coming back for more. But don’t forget – your apartment should always be a reflection of your own personal style. If decorating and throwing parties isn’t your thing, that’s fine. But if you want to make a name for yourself in your new neighborhood, showing your great style and your excellent hosting skills is the way to go.